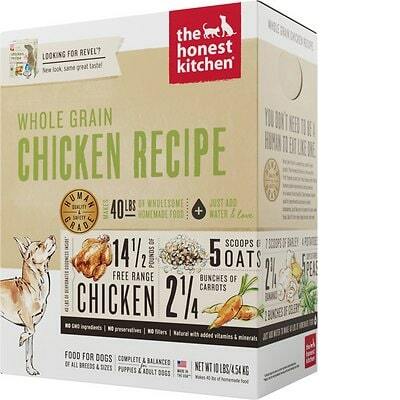 The Honest Kitchen Whole Grain Chicken Recipe is a high-priced dog food with great quality. This product has zero controversial ingredients, and therefore also no artificial preservatives, colors or flavors. However, it has a high amount of carbs, compared to its protein and fat, but the meat and fat quality in the food is excellent. The Honest Kitchen has a below-average number of recalls and was very transparent when answering our questions. Watchdog labs recommends this product. The food has high carbs and somewhat low protein and fats, making it less nutritionally balanced compared to other dog foods we evaluated. Carbohydrates are cheap so they keep the food’s cost low and they are nutritionally useful to dogs in the right amounts. However, very high amounts of carbs can reduce the much-needed meat-based protein and fat content. Free-Range Chicken, Organic Barley, Potatoes, Organic Flax, Organic Oats, Green Peas, Carrots, Bananas, Parsley, Organic Kelp, Celery, Tricalcium Phosphate, Choline Chloride, Zinc Amino Acid Chelate, Vitamin D3 Supplement, Vitamin E Supplement, Potassium Iodide, Potassium Chloride, Iron Amino Acid Chelate, Copper Amino Acid Chelate, Sodium Selenite, Thiamine Mononitrate, DHA, EPA. Chicken is generally a healthy dog food ingredient that provides nutrients like protein, fat and B vitamins. Raw meat contains about 75% water which is cooked off during the making of dog food. This leaves only a fraction of the protein content in the final product's weight. We recommend looking for dog foods that also include meat meals in the first five ingredients (pre-cooked meat powder that contains four times the amount of protein). "Free range" is a method of farming where the animals can roam freely outdoors for at least part of the day. Barley is a type of grass and a cereal grain. It is a source of calories and several nutrients, including protein, dietary fiber, B vitamins, niacin and various minerals. Barley provides carbs, energy, fiber and other healthy nutrients for dogs. Organic barley is generally a healthy dog food ingredient. Organic dog food ingredients are free of antibiotics, synthetic hormones, pesticides, chemical fertilizers and artificial preservatives. They are also not allowed to be genetically modified. Flax (also known as linseed), is a plant that contains high levels of protein, dietary fiber, B vitamins, and dietary minerals. Flax is also very rich in thiamine, magnesium, potassium, and phosphorus. It's unique in that it is one of the best plant-based sources of Omega-3 fatty acids. We consider it a high-quality dog food ingredient. Organic dog food ingredients are free of antibiotics, synthetic hormones, pesticides, chemical fertilizers and artificial preservatives. They are also not allowed to be genetically modified. Oats are a cereal grain and a source of carbs, protein, dietary fiber, several B vitamins and dietary minerals like manganese. They are a high-quality dog food ingredient that can potentially help with colon health. Organic dog food ingredients are free of antibiotics, synthetic hormones, pesticides, chemical fertilizers and artificial preservatives. They are also not allowed to be genetically modified. The Honest Kitchen Whole Grain Chicken Recipe has no controversial ingredients. This dog food is made in the United States, which means high quality and food safety standards need to be followed, so that’s a great thing. Free-Range Chicken is the meat used in this food. It’s good that the animal this meat comes from is clearly identified. The food has no added oils, so the fats in the food come from the chicken and from plant ingredients. Free-range chicken, by the way, is a higher-quality ingredient than regular chicken and makes it likely that these chickens lived under a higher animal welfare standard. 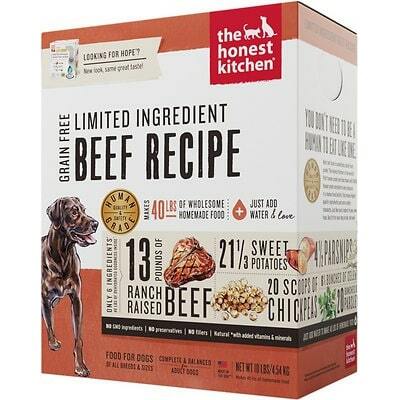 Not many dog foods use free-range meats, so this is a rare and excellent choice by The Honest Kitchen. The Honest Kitchen Whole Grain Chicken Recipe contains 0 controversial artificial preservatives. It’s good to know that ‍not all artificial preservatives are bad. That’s because they serve an important purpose, which is to prevent food from spoiling. However, we consider 11 artificial preservatives controversial because of their potential link to cancer and other serious health conditions. Last but not least, this product manages to shine by also not using any artificial flavors. No artificial preservatives, colors or flavors is exactly what you want to look for in dog food. Well done! This brand has a below average number of recalls. Verve, 4lb box, 6 units/case, Item# V4, UPC 183413000 89 5, and 10 lb box, 4 units/case, Item #VR, UPC 183413000 17 8.. Free Thrive, 1 oz. sample, 50 units/case, Item#TM, UPC 183413000 81 9. Zeal, 4lb box, 6 units/case, Item#Z4, UPC 18341300195 3, and 10lb box, 4 units/case, Item# ZR, UPC 18341300191 5. The Honest Kitchen is recalling five lots of its Verve, Zeal and Thrive pet food products because they have the potential to be contaminated with Salmonella. The Honest Kitchen responded to the first email quickly, in less than 24 hours. There was one follow up email that was responded to just as quickly. The answers were very transparent with only a few missing pieces of information that could not be provided. Lucy Postins, our company founder and CEO, develops all our product formulations. Lucy has a Bachelor’s Degree in Equine and Business Studies from Warwickshire College of Agriculture in the UK and her studies included anatomy, physiology and nutrition. Lucy has worked in the pet food industry for almost twenty years in the fields of marketing and product development. In addition, we work with two consultant holistic veterinarians who evaluate and endorse our recipes as they are developed. Unfortunately, because of privacy issues we are unable to provide that information. All our recipes (with the exception of our two base-mixes) are formulated to meet the AAFCO nutrient profiles. The values of key nutrients are also tested at an independent ISO accredited laboratory during the product development phase, and are routinely re-tested periodically. We've made an ethical decision not to conduct formal laboratory / kennel based animal testing. We utilize independent laboratory analysis to verify the nutritional content of our diets and to confirm they meet AAFCO requirements. All of our recipes are manufactured here in the United States. Our facility is FDA inspected, has SQF level II certification and has been toured, under a confidentiality agreement, by Nancy Kerns, the editor of the Whole Dog Journal. The Federal FDA has reviewed our entire supply chain and food production process, and has provided The Honest Kitchen with a letter of no objection, which allows us to state Human Grade on our labels. The Honest Kitchen’s Supplier Quality Expectations Manual acts as a code of conduct for our suppliers, and clearly outlines the food safety standards we demand from every vendor we purchase from. All our suppliers are required to certify that their facilities and products meet the standards outlined in the manual, which are verified via third party or THK audits. 100% of our ingredients are sourced directly from the human food supply chain, and our foods are blended in a facility that produces human food products, like cake mixes and other dry goods! Our foods have been reviewed by the FDA and with that we have a letter of no objection from them, which allows us to state Human Grade on our labels. For us, being human grade is the ultimate line in the sand when it comes to food safety, quality and integrity. We also require each and every supplier to provide us with a signed ‘Human Food Grade Guarantee’ and ‘Statement of Quality and Integrity’, which are renewed annually. We also conduct independent audits of each of our suppliers, which include reviews of their HACCP food safety plans and supply chain risk assessments. Our products are made at a co-pack facility that is independently owned. The facility makes a variety of different human food products in addition to The Honest Kitchen, and ours is the only product intended for pet consumption, that is made there. Our human grade pet food products are made in a human food production facility, located in Illinois. The facility also processes a variety of food products that people eat, such as bakery & soup mixes, breakfast cereals and milkshake powders. The name and address of our facility is proprietary, and isn’t made available to members of the public for confidentiality reasons, both for The Honest Kitchen and for the other human food clients whose products are made there. There are no products sourced from China.